Researchers have developed a new way to use plant oils like olive and linseed oil to create polyurethane, a plastic material used in everything from foam insulation panels to tires, hoses and sealants. The researchers, led by Michael Kessler, Berry Family director and professor in Washington State University’s School of Mechanical and Materials Engineering, have published a paper (http://pubs.acs.org/doi/pdf/10.1021/am5071333) on the work in the journal ACS Applied Materials & Interfaces (http://pubs.acs.org/journal/aamick). Polyurethane is extremely tough and corrosion- and wear-resistant, but researchers would like a more environmentally friendly alternative to the petroleum-based product. About 14 million tons of polyurethane was produced in 2010, and production is expected to increase by almost 30 percent by 2016. While there are already some polyurethanes made from plant materials, Kessler’s research group developed a new method that uses vegetable oils to create materials with a wide variety of flexibility, stiffness and shapes. Plant oils are inexpensive, readily available, renewable and can be genetically engineered. In the study, the researchers made polyurethane using olive, canola, grape seed, linseed and castor oils. While other researchers have struggled with using petroleum-based solvents, the WSU researchers, working with colleagues from Iowa State and from Cairo universities, didn’t use solvents or a catalyst in their production. 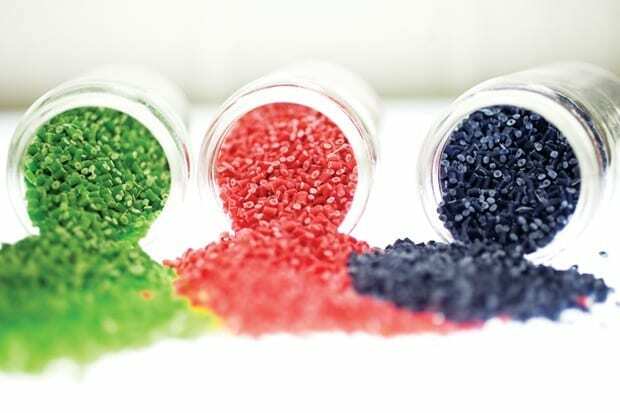 To make polyurethane, manufacturers combine two types of chemical compounds in a reaction. One of the chemicals is a polyol, which is a compound with multiple hydroxyl functional groups that are available for reaction. April 18, 2019 - These amazing microbes could eat electricity and produce bioplastics World Economic ForumScientists have figured out a way to feed electricity to microbes to grow truly green, biodegradable bioplastics, according to a new study. April 15, 2019 - Bioplastics could be "just as bad if not worse" for the planet than fossil-fuel plastics DezeenBioplastics could potentially be worse for the environment than conventional plastics, according to recycling expert Arthur Huang. April 12, 2019 - Electricity-eating microbes could make bioplastics Futurity: Research NewsResearchers are working on "sustainable, carbon-neutral, and low-cost" bioplastics. April 17, 2019 - Ohio State University develops rubber-reinforced bioplastics - Rubber & Plastics News RubberNews.comCOLUMBUS, Ohio—Researchers at Ohio State University have combined natural rubber with bioplastics to develop a. March 22, 2019 - Switch to bioplastics is the first step towards a greener planet South China Morning PostBioplastics, which are made from plant material, may not entirely solve the problem of pollution, but it could cut dependency on oil, say supporters. March 20, 2019 - Bioplastic Will Save The Planet From Italy, Through The Blockchain ForbesA group of pioneers is ready to free us from plastic without giving up our habits. April 18, 2019 - Row blows up over disposal of bioplastic bags in West Sussex West Sussex County TimesA row has blown up over the disposal of 'compostable' bioplastic bags in West Sussex following concerns raised by a leading Horsham councillor.